Alright, time to test my new camera! I wanted to do this one earlier, but the photo’s with my old camera were so bad it wouldn’t do justice. 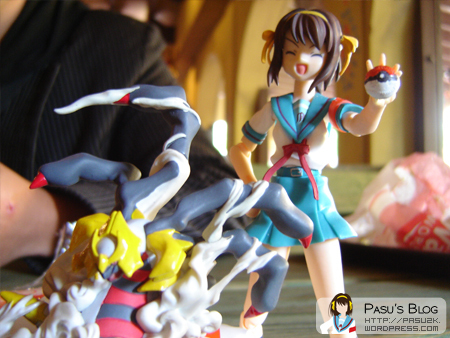 It’s time for my favourite PVC figure in my collection: Haruhi Suzumiya Gekisou Version (aka Extravaganza Version). Just got back from Pokémon Day here in Holland! They had the special Regigigas downloadable which was the main reason I went 8D To my surprise, the goodiebag contained the figure of Giratina, which you could previously only get if you pre-ordered Pokémon Platinum (as far as I know, anyway)! Alright, summer vacation! Time to do some reviews and I wanted to do this one for a while now. I’ll first explain the title for you: It’s Battle Waitress Asahina Mikuru from the Suzumiya Haruhi no Yuuutsu series, by Atelier Sai. When I saw her in the box and bought her, it looked so cool! But when I was home and had it on display for a while, I became very disapointed. Sure! It looks really awesome if you see it like this, but there are some major problems with this one! Woo, it’s such nice weather outside~ I do want to show you all the new figma’s I got the last two months, so LET’S GO OUTSIDE AND TAKE SOME PHOTO’S! Right, Haruhi? 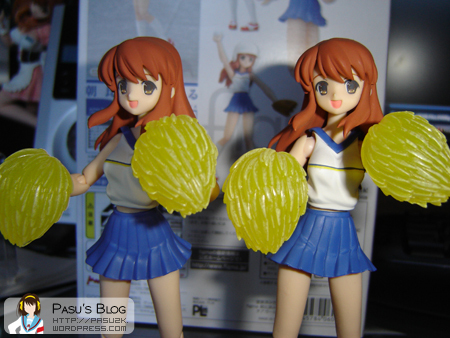 Yep, I also fell victim to those cheap cheap deals on eBay 😦 When I bought figma Mikuru Asahina Cheerleader Version, I though “Well, it’s fairly new. No way they already faked this!” I was very, very wrong. When I first saw it I was like “Hmm, it doesn’t look as bad as some cheap bootleg of PVC figures I’ve seen” and to be honest it isn’t even THAT bad. However, when I got a REAL one (of a seller I’ll always trust), I noted some differences. Here they are together! Can you already spot some differences? No? Then read the rest of the entry and I’ll show you how to spot fake figma’s! Review: figma #18 Tsuruya-san School Uniform Ver. 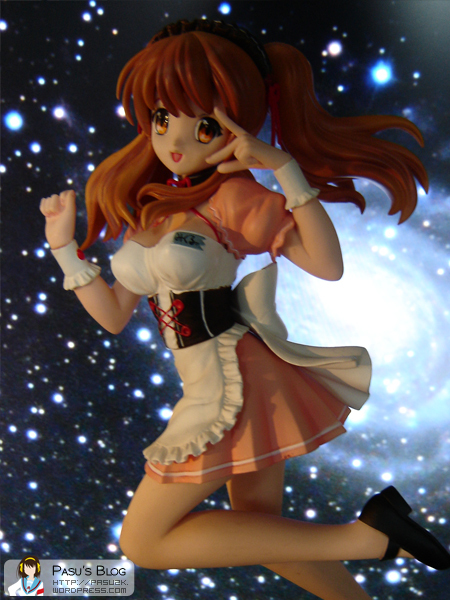 Hooray, figma finally put the new Tsuruya-san on their website, so I’m going to review the old one! That makes sense, right? Sorta? Oh well… Here’s Tsuruya-san! Tsuruya-san (last name not known) is a minor character in Suzumiya Haruhi no Yuutsu, where she is introduced as a friend of Asahina Mikuru. Though not a member of the SOS Brigade, she did help out on various events like the recording of the movie “Mikuru Asahina’s Adventure – Episode 00” and the baseball match. Doujin artist Utsura Uraraka made a super deformed, smoked cheese-crazed, “Nyoro~n”-saying, character of Tsuruya-san, named Churuya-chan, which gave the character a much bigger fanbase. 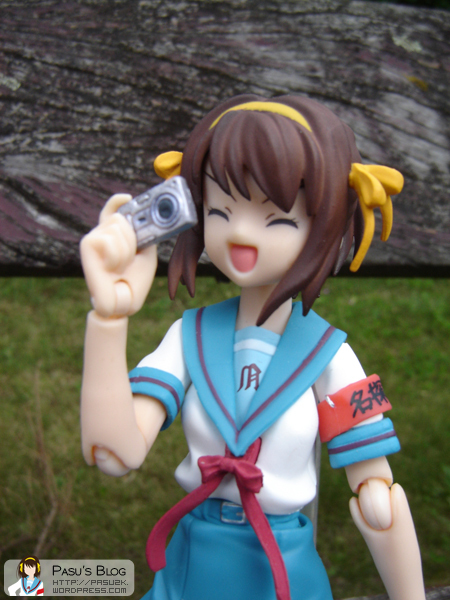 Yes, Haruhi-chan! It’s an ONA, Original Net Animation, meaning it’s released on the (inter)Net. 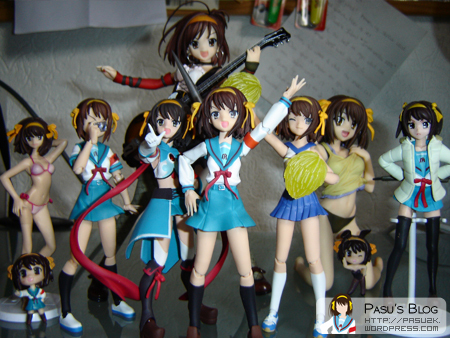 Haruhi-chan is obviously based on “The Melancholy of Haruhi Suzumiya”, an anime that got quite a fanbase (and also makes the biggest part of my figurine collection~). After the successful first season of the anime, people wanted more! While we all still wait for season 2 to start, we get this series of 5 minutes per episode. 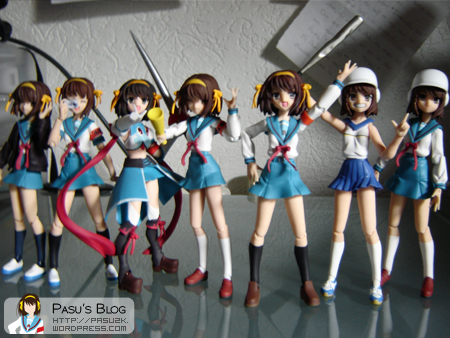 Haruhi-chan follows the chibified form of the members of SOS-Dan, I’m guessing after season one of the anime. It seems more characters are in the Brigade now though; Taniguchi, Kunikida, Tsuruya-san and even Kyon’s sister are pretty much there the whole time. It also shows Asahina Ryoko is still on Earth. She incarnated, but turned out to be the size of your average 1/6 scale figure~ So obviously Yuki keeps her in her apartment as a pet! There currently are 10 episodes, but 1-5 are already taken down of Youtube, meaning the hoster, Kadokawa, only keeps them live for a few weeks. Though, that’s okay, because the first four eps were computer generated and it didn’t look too well. Episode 5 and up are drawn in Lucky Star style~. Luckily nothing is safe on the internet and Shamisen-subs have ripped them all, making them in wonderful upscaled MKV files!